Since 2016, the leading Russian architectural school—the Moscow Architectural Institute—has had a unique department called “Church Architecture”. The beginning of the preparation of design specialists in the field of church construction is connected with the need to revive age-old traditions of architecture which were lost in the twentieth century, as well as the restoration and reconstruction of numerous destroyed and desecrated churches across all Russia. We spoke with the academic Dimitry Shvidkovsky, the vice president of the Russian Academy of Arts, and rector of the Moscow Architectural Institute on returning to the origins of our spiritual culture, and what constitutes the contemporary language of church architecture. —Dimitry Olegovich, what is the history of the origin of the Department of Church Architecture in the Moscow Architectural Institute? What factors were decisive for you in its creation? —The department began its existence two years ago with the blessing of His Holiness, Patriarch Kirill of Moscow and of all Russia. I have long desired that our institute become more connected with the Orhtodox Church, and Orthodox education, and this is required for the return of our architecture to the Orthodox World, after it’s almost century-long absence from it. There were of course professional reasons: We had destroyed a huge number of churches; if in Moscow it was only more than seven hundred that were destroyed, then across the country it had been tens of thousands of churches. Today, now that there is a lot of construction work, it is extremely important that specially trained people conduct it. After all, until this month, we did not even have professionals in the field of church construction; it was only a couple of weeks ago that our institute sent out the first groups of masters of church architecture. —What in your opinion is main objective when reviving the traditions of church architecture? —Our main goal now is to connect the time in which we live, to the years when the last churches [before the revolution.—Trans.] were built. The construction of such a bridge between the two epochs is very important: The times before the 1917 revolution seem to me to be a period of one of the highest manifestations of Russian Church architecture, which by no means was in decline, but on the contrary, it was on the rise and flourishing. All the leading architects of the country of that time—Alexey Viktorovich Shchusev, Fyodor Osipovich Schechtel, Vladimir Alexandrovich Pokrovsky, Petr Fyodorovich Fedorovsky, and many others—without a doubt built churches. In prerevolutionary Russia, there were practically no architects who didn’t build churches. Perhaps the most notable figure of that time was Alexey Shchusev, who later built the Lenin Mausoleum as we know, however before the revolution, he erected thirty eight beautiful churches, many of which became outstanding works of Russian architecture of that time: The Church of Sergius of Radonezh at Kulikovo Fields, Trinity Cathedral in Pochaev Lavra, and Martha and Mary Convent in Moscow, which was commissioned by the Grand Duchess Saint Elizabeth Fyodorovna [Romanov(a)]. At that time, there were many movements in church architecture; in many respects, the masters turned to historical prototypes: Pre-Mongolian Churches [Russian architecture prior to the mid-thirteenth century Mongol Invasion of Rus’—Trans.] Novgorod-Pskov Ancient Russian architecture. But in all, there were also new trends when the most modern materials and construction were used: metal, concrete, glass, etc. That is to say, churches were built even by those who later became the founders of Russian avant-garde: the Vesnin brothers, Barkhin, as well as many others who built temples throughout Russia before the revolution, especially in the Volga region in the late seventeenth and early eighteenth centuries. And our students first of all study the history of Orthodox architecture. This is a year-long course, accompanied by seminars where students make reports, and conduct research on specific churches, and I need to say, this is leading to very good results. For two years of its existence, and just graduating class, the department has become the source of some of the brightest architectural works in the institute. —Dimitry Olegovich, is it possible to built a bridge between two centuries, and how difficult is it now? After all, how many churches have been destroyed, generations changed, and documents lost. What are the chances to revive the lost architectural heritage of our country? —First of all, it wasn’t only a small number that survived, even in Moscow. We can see Martha and Mary Convent, and the wonderful Church of the Resurrection of Christ in Sokolniki, built in the old Russian style, not to mention monuments of the architecture of the seventeenth and eighteenth centuries and even older. Secondly, Russian society, especially the Russian intelligentsia of the early twentieth century were very well educated, including architects. A lot was written then about the church architecture of that time and before. One by one in the end of the nineteenth and beginning of the twentieth centuries, books were published on Ancient Russian architecture. For example, the multivolume History of Russian Art edited by Igor Emmanuilovich Grabar, books by Krasovsky, Sultanov, and others. And most importantly, the process of building churches of that time was very well documented. The Moscow Society of Architects and the Imperial Society of Architectural Artists in Saint Petersburg published in their yearbooks all the best designs and constructions—there are dozens of volumes! Now we have chosen from them the main examples and republished it as a textbook. —Does the department have a favorite period in the architectural life of Russia to which special attention should be given? Therefore, we don’t have to choose one period to follow; that would be completely wrong. Who gave us the right to judge what has already existed in history? Now that a quarter of a century of church architecture has already passed, albeit not as active as it would have been, but I believe that we need to start from the place where we stopped—to return to one hundred years ago. At that time, a very high level of diversity was achieved—a colossal wealth of forms with their intertwining in the most recent innovations in constructive art. And there is every reason to again and again draw from this Silver Age, which was high in all fields, with its literature, music, painting, architecture, etc., in order to continue down this great path. —Does there exist in Church architecture a division between the styles of the capital cities and the provincial? The peculiarities of Russian church architecture in different parts of Russia are connected, first of all, by their history and role in it. 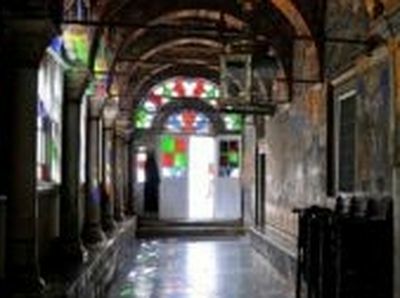 In some parts of our country astonishing schools of architecture were preserved. It’s enough to recall Great Novgorod with its preserved and restored churches: Saint Sophia’s Cathedral1 in the [Novgorod] Kremlin, Yuriev Monastery2, Antoniev Monastery, the Church of the Savior on Nereditsa, which is famous for its twelfth century frescos, and many others. Pskov contains almost the same number of churches, but in a completely different style. If the Novgorod style is very strict, restrained, geometrically precise and graphic, then Pskov, on the contrary, is picturesque, soft, as if fashioned by hands. Both of these schools date from the turn of the eleventh and twelfth centuries. The church architectural heritage of Yaroslavl and Rostov the Great, preserved an amazing school of red brick with completely unique multi-colored tiles, a vivid example of which is the Yaroslavl Church of Saint John Chrysostom in Korovniki. There were northern schools; for example, Stroganov churches on rock-salt mines of the 16th-17th centuries. There are very interesting schools to the north of the Kostroma region (Galich, Chukhloma,) and in Smolensk. No less interesting are the “younger” schools with many wonderful churches of the 18th century—the famous Optina Pustyn in the Kaluga region is an example. By the time of the revolution, there were more than 1000 monasteries in Russia. Some of them, such as Diveevo and Optina Pustyn are highly glorified for their great saints, and are now very well restored not only architecturally but frescoed as well, and are accepting a huge number of pilgrims. Diveevo, for example, receives around two million people per year. —And what was the fate of the architectural restorers after the revolution? A very serious and high-quality school of restoration experts was created in the Soviet Union. The History of Church Architecture was taught at Moscow Architectural Institute since 1934, and the department of restoration was established in the 1970s by people who still studied during the time of the Russian Empire. There were remarkable specialists and experts: Gabrichevsky, Brunov, Toropov, Bessonov, Zubov, Bunin, Kostochkin and others. They had it very hard, some of them were deprived of rights during the Soviet era, some were actually starving, others were arrested simply because they came from famous families. The founder of the history of urban planning in our country, Andrei Vladimirovich Bunin, was a relative of the Nobel Prize laureate Ivan Alexeevich Bunin. Alexander Gregorievich Gabrichevsky, a theoretician of plastic parts, was arrested several times and twice exiled in the 1930s. Vasily Zubov, a versatile and amazing scientist, the “Russian Leonardo”, was from a family who owned the rarest of musical instruments, including Stradivari violins, which they transferred to the M.I. Glinka Museum of Music in Moscow, as well as the most valuable collection of ancient Russian and oriental coins, transferred to the historical museum. Maria Vasilievna, an heiress of the Zubovs is still alive and remains a professor of our institute. Those who worked on the restoration of churches in the past truly risked a lot, but they still continued to do that which they loved. Victor Ivanovich Baldin, the future director of the Museum of Architecture began to restore the Trinity Sergius Lavra in 1937, and continued to do so all his life; it is difficult to imagine what kinds of hardships befell him because of this in that time. But they were people on an absolutely different level, with a different strength of faith, and a different willpower, because they were not afraid even after the 1930s, after all the executions. They continued to write and speak in defense of the monuments of church architecture. For example, Saint Basil’s Cathedral, which they [the Bolsheviks] wanted to destroy for the convenience [extra space] of parading around military equipment on red square, was saved thanks to the efforts of the restorer, Peter Baranovsky. —How did the restoration of church architectural heritage develop, if it indeed did develop, during the Great Patriotic War [World War II], and what did the specialists in church architecture do during the post-war years? —It was a time of contradictory situations. If you take the Germans, they, on the one hand, destroyed much, having no regard during their offensives for historical monuments, as it happened with the New Jerusalem Monastery near Moscow, which suffered a great deal during the war. It was mined, and its Resurrection Cathedral was blown up. On the other hand, they tried to play games with the church as it were, when they tried to open churches in the occupied territories. It was during the Great Patriotic War that positive changes occurred in our country relating to the Russian Orthodox Church. Stalin, being in fact a seminary graduate, understood what religion and the Church meant to people, and therefore, mobilizing the country in the most difficult times, he turned to the Church as well. At this time, architects painted future victory monuments3, using the legacy of church architecture. Of course, under Stalin, talk was not directed literally about Churches, but rather, about projects in the spirit of church architecture. That is to say, no churches were built to commemorate the victory in the Great Patriotic War during the Soviet Period. After the collapse of Soviet Union, such church architecture memorial projects began to be executed, such as the one on the site of the battlefield of the Battle of Kursk, where there now stands the Church of the Great Martyr George the Victorious. After the war, specialists were engaged in restoration in to the extent that was possible. The position of the authorities became somewhat softer with regards to the restoration of historical monuments, but with the Church, not so much. Later, under Brezhnev, one of the important tasks was attracting tourists. The authorities wanted to organize domestic tourism. Major programs were adopted, including “The Russian North”, and “The Golden Ring of Russia”. Against this backdrop, many outstanding churches were saved. Restoration work on large complexes such as the St. Cyril of White Lake (Belozersk) Monastary, St. Joseph of Volokolamsk Monastery, Ferapontov Monastery, and Solovki Monastery, and the Holy Trinity-St. Sergius Lavra was almost completely restored. But of course, the restoration that occurred was purely physical—as historical monuments and not as monuments of the Spirit and Church. —What types of students choose to study in the department of church architecture, and how do they enter it? We consider the applications of people with a Bachelor of Architecture diploma. They present their artistic work, and are interviewed. In the departments first year of existence, there were already two or three people who got accepted. We are engaged in projects related to Orthodoxy, but we do not interfere with the questions of our students’ faith, as we do not have the right under the law on education. In this matter, we hope on the Lord, that He will guide us as needed. Among those coming to the department include even unbelievers, who are simply interested in a new field of construction, as well as deeply religious people, even from the families of priests. The project of the Russian-Serbian church in Banja Luka, Republika Srpska. There are many representatives of architectural dynasties—on one of the projects we were working on, we had with us a young man and girl, who were fourth generation graduates from the Moscow Architectural Institute; that is to say, their great-great-grandfathers were also architects. In the process of working on the project, they even got married, and then gave birth to a child. By the way, they have developed their project of the Russian Serbian temple in Banja Luka4 even more than our students usually do: They not only made a sketch outline of the church, but also a construction project, developed an iconostas, paintings, and church objects. This is our most extensive project, but we also have other interesting ones: several projects on monasteries, among which is the restoration of old ones and the construction of new ones. We have a project for a cathedral in the city of Pervouralsk, in the Yekaterinburg region, which was brilliantly defended by a graduate of our department, but, unfortunately, he died shortly thereafter. We will insist that the project be implemented, because it is truly very good. There are interesting landscaping projects related to monastery gardens. The author of one of the projects studied which plants were in the Holy Land during the earthly life of Christ according to the Bible, and chose from among them plants that can grow in our country, making a garden project consisting of these plants. —Last year, at a meeting of the Holy Synod, the position of “diocesan architect” was approved. How will it influence Church Architecture? —Before the revolution, each diocese had its own architect. The All-Church Council on church décor headed by Archpriest Leonid Kalinin worked actively to prepare and adopt a document on the introduction of the offices of Diocesan Architect and “Antiquity-keeper” [Russian: древлехранитель] 5, and as a result, both provisions were adopted. And most of the vacancies of diocesan architects are now already occupied. And Antiquity-keepers must ensure that the restoration was correct, paying special attention to the preservation of ancient icons and church objects. They must also create museum sacristies in churches, or in the centers of the Metropolia or Diocese. Diocesan architects have always affirmed church projects. We are now seeking to ensure that these specialists pass our advanced training [refresher courses]. As they may indeed be already experienced architects, in this case, we have signed an agreement with the church postgraduate and doctoral studies institutions, headed by His Eminence Metropolitan Hilarion, that we will jointly conduct advanced training [and refresher courses] for diocesan architects. —Dimitry Olegovich, what is your position on the program of building churches within walking distance in Moscow? It has evolved, and continues to evolve in the right direction. In the beginning, there was talk of building typical churches, and this was unsuccessful. Then they went on to discuss churches constructed differently of typical elements. Fortunately, His Holiness the Patriarch ordered that all churches be individual in their appearance. And we in the Moscow Architectural Institute sincerely and profoundly support His Holiness’s absolutely true and right decision. —How do you picture the church buildings of the twenty-first century? In our country, the twenty-first century church buildings should be constructed in the forms of historicism—one or another. It can contain historical images, but with regards to materials and functional devices it can be completely new; after all, we are now trying to build not just churches, but entire church complexes, sometimes all in one, but grandiose in volume, like the Cathedral of Christ the Savior6. Or on a smaller scale, take the Church of St. Sergius of Radonezh on Khodynka Field, which Sergei Yakovlevich Kuznetsov built on a small piece of land. This was a very successful project with a domed basilica, which is a rare type of church, more common in Byzantium. And here on the same level as the church were built a Trapeza [refectory], parish school, and administrative facilities. Today the life of the Church is changing, and this also dictates the function of the church building. And the image of the church, in turn, dictates the history of the Church. And we correlated the image of the church with the prototype—with the oldest churches, the holy sites of the Russian land, with those connected to the life of the Savior and great Saints, and with the historical tradition of Orthodox in general. It was such a rich and amazing tradition, which absorbed in itself what was around in Christ’s time, as well as the ideas of classical architecture—Byzantium was all that—a country, which preserved the culture of classical antiquity one thousand years after the Nativity of Christ. And this means so much, and contains many different meanings. Thus, the theology of Uncreated Light is extremely important for the modern image of the church, and it came to Rus’ from Byzantium. The Orthodox heritage is so great. May God grant that we learn it, to take it into our souls, and express it in the forms of churches. Church architecture should not set the same goals as secular architecture—for example, to simply impress everyone. It must aid in the strengthening of the Orthodox Faith. 1 Often cited as the oldest extant (still standing) Rus’ church, this can be debated; for example: The Tithes Church in Kiev, the first stone church in Rus’ built by St. Vladimir the Great would be older, had it not been ruined. It was raised to the ground three times however, and the most recent incarnation of the Tithes Church, built in the later Imperial Period, and destroyed by the Bolsheviks, was not nearly as old as the original Tithes Church, or therefore Saint Sophia’s. 2 Yuriev Monastery was built by Yaroslav the Wise, son of St. Vladimir, in honor of Saint George, his patron Saint. It is often cited as the oldest monastery in Russia, but this is debatable. It may be the oldest on the territory of the modern Russian Federation, but Kiev Caves Monastery, now in Ukraine, is considered the oldest in all the Rus’ lands. Yaroslav also built Saint Sophia’s Cathedral in Kiev, in honor of the older Saint Sophia’s in Novgorod, when he—the former prince of Novgorod—became Grand Prince of Kiev. 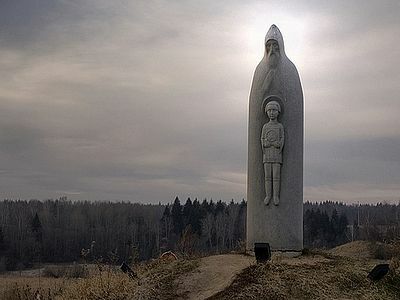 3 In every part of Russia, Ukraine, and Belarus, you will find monuments dedicated to victory in WW2. It is a permanent part of the national psyche. 6 While the Cathedral of Christ the Savior, the de facto patriarchal cathedral appears on the outside to be one massive structure, it also contains within its extensive grounds and sublevels entire meeting halls, including an auditorium, another church, church stores, displays, offices, administrative functions, and much more. Compare this with the old and still formal Patriarchal Cathedral of the Dormition inside the Kremlin walls, which does not even possess its own bell tower, but is rather served by the adjacent Ivan the Great bellower. If anything, the style of modern, twenty-first century monumental cathedrals is distinguished in that they are large complexes that fulfill many different functions, as we have also seen similar projects in Ukraine, Georgia, Serbia, Romania.—Trans. 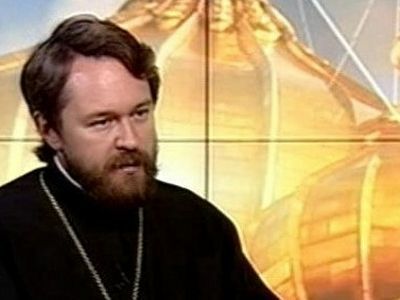 On September 26, 2015, Metropolitan Hilarion of Volokolamsk, anchorman of the Church and the World talk-show on Russia-24 TV network, hosted film director Andrei S. Konchalovsky. I have seen website. I really liked your belief and mission.